F ounded by Michel Parmigiani in 1996, and located in Fleurier, Switzerland — Parmigiani Fleurier is a rare brand; a true watch manufacture that has only been in existence for 16 years. Most of the brands who manufacture their movements in-house have been around for over a century. Furthermore, while a watchmaker only needs to make one complete caliber in-house in order to call themselves a manufacture, Parmigiani, actually makes movements for all of their timepieces in-house. In fact, through their company, Vaucher Manufacture Fleurier, they supply many of their competitors with essential watch components. 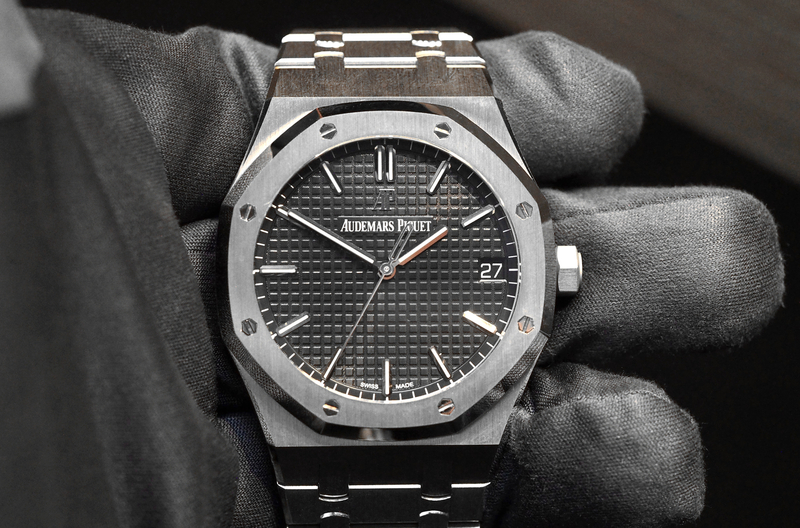 They may be young, but they are a truly integrated manufacturer, capable of producing timepieces from start to finish. For this review, Parmigiani Fleurier sent us a Fleurier Pershing 005 with a stainless steel bracelet. The Pershing is the brand’s collection of sports watches. Befitting a sports watch, the Pershing 005 comes in a substantial stainless steel case that measures 45 mm by 14.2 mm. The round case is finished with both polished and satin-brushed surfaces. A large unidirectional rotating brushed steel bezel with triangular-shaped black vulcanized rubber notches is marked with ‘0-60’ which in conjunction with the long central second hand can be used to read the chronograph seconds, or like a traditional dive watch, it can be rotated and used as a 60-minute timer. Speaking of a diving watches, not only is the bezel reminiscent of a diver’s watch, the case’s solid caseback and locking crown, which allows the timepiece to go 200 meters, are as well. The large hour and minute hands which are coated with a generous amount of luminous material, are also something you might expect on a diver’s watch. However, the hour markers, which lack luminescence, communicate that this is more of a sports watch than a diver. When you turn over the timepiece, you will notice an emblem of a Pershing yacht engraved into the case back, which explains why this model has so many dive watch cues. On the wrist, the Pershing 005 is a fairly heavy timepiece, and it wears pretty big. Definitely, a piece we recommend for a medium to larger wrist. The crown is large and very easy to unlock and operate, without digging into the wrist too much. However, the bracelet, while comfortable, seems a bit large. It has a tapered bracelet, but it is much wider at the lugs than the leather or rubber strap option. To give you a better idea, the bracelet is approximately 31 mm at the edge of the lugs, whereas the strap is only about 23 mm. This means the strap will not only be a bit more comfortable, it will also have a different aesthetic. Inside, is a manufacture caliber PF334 self-winding movement embellished with perlage on the main plate and Côtes de Genève on the bridges. The self-winding mechanical chronograph movement runs at 28,800 vph (4Hz), with a 50-hour power reserve — typical for an automatic chronograph. However, what isn’t typical, is that it has a total of 303 components, with 68 jewels. And two series-coupled power barrels. Everything is finished to very high specs, even the bridges are hand-beveled. You might wonder why all this detail and finishing is put into a movement that is not even viewable on the case back. Well, there two schools of thought. Some collectors will want a clear case back, and some will want a solid case back. 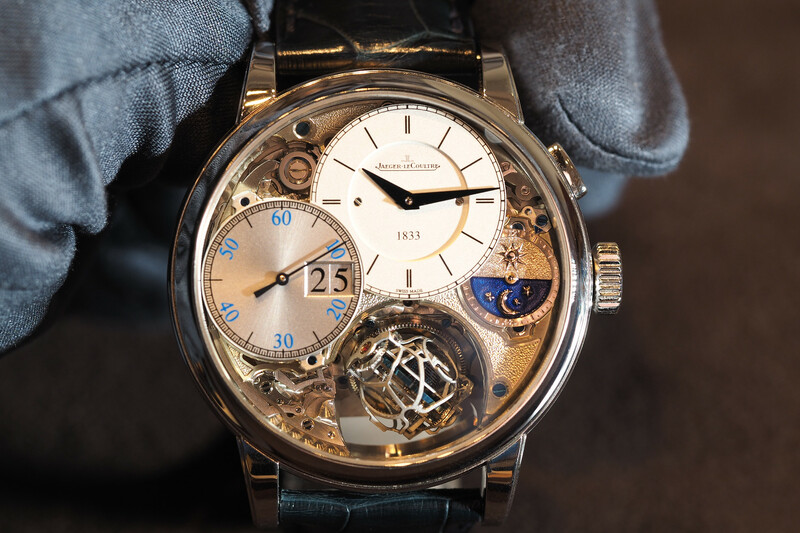 Regardless of which category you fall into, it is standard for a company at this level of haute horology, to finish the movement to this degree. Functions include hours, minutes, small seconds, date and chronograph. The dial is, made at Parmigiani’s dial making facility, is in black metal, with a nicely done vertical striped pattern. The hour markers are in polished silver and are applied. Large Delta shaped hour and minute hands are accented with silver polished edges. At 3 o’clock is the small seconds display. At 6 o’clock is a 12-hour chronograph counter with a wide date at the bottom and a silver circular snailed finish. 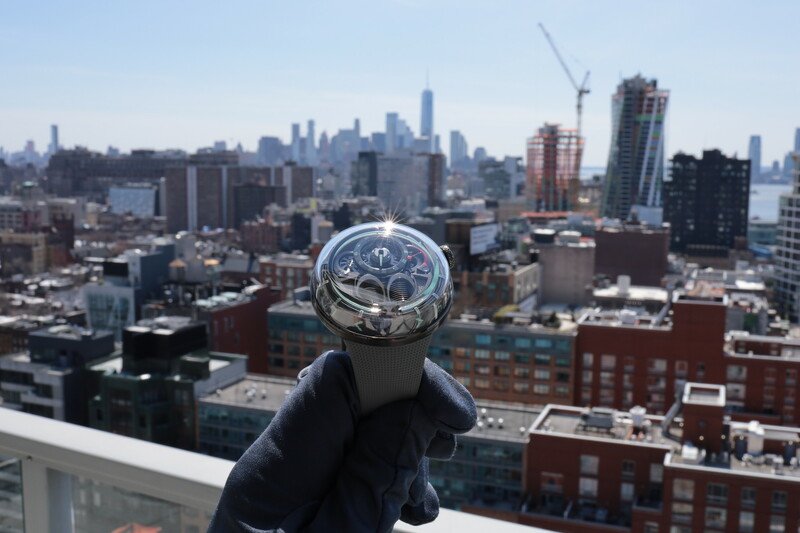 Connected to the hour subdial is a 30-minute counter, with a silver circular snailed finish. 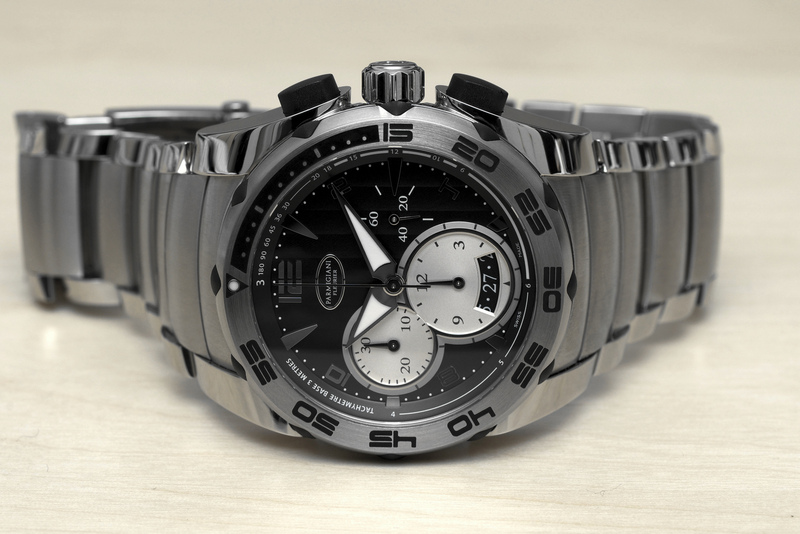 The chronograph second hand is in polished silver. The 8 mm diameter locking steel crown is signed and features a polished finish. The chronograph pushers are flat and are in vulcanized black rubber on the steel model (gold models come with metal pushers). The dial is protected by a flat glareproofed sapphire crystal that protrudes ever so slightly above the bezel. The rotor is skeletonized and engraved with the Parmigiani Fleurier logo (a 22K gold rotor comes on the gold models). Each piece is individually numbered. The Pershing 005 is a bold sporty timepiece from a haute horology manufacture among the best in the world. So as you would expect, every detail has been paid close attention to. Even the movement, which is hidden behind a solid case back, is finished to the highest standards. The 005 comes in a variety of dial choices, and variety of cases: steel, white gold or rose gold. Additionally, you can choose from a steel bracelet (shown), a rubber or alligator leather strap. We recommend the latter, for both comfort and aesthetics. The case size is made for a more robust wrist, so if you like this piece but have a small wrist, we recommend the checking out the smaller 42 mm Pershing 002 as well. (Ref. PFC528-0010301) The retail price is $18,500.